The hydrostatic pressure under a static liquid column increases proportionally with the height of the column. Thus, for example, the pressure in a water tank becomes 100 mbar higher, compared to the effective atmospheric pressure on the water surface, with every metre of water depth. 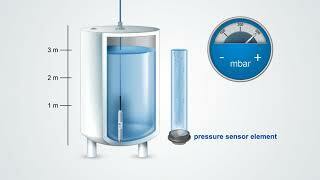 For indirect level measurement, pressure measuring instruments are used. Depending on the application, either a submersible pressure transmitter is submersed into the tank or another pressure measuring instrument is attached to the bottom of the exterior of the tank and exposed to pressure of the tank contents through an opening in the bottom of the tank. 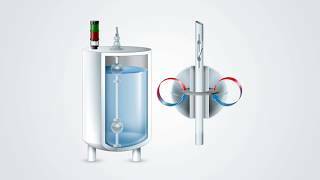 With closed tanks, for the level measurement, the gas pressure existing above the liquid in the tank must also be measured and be subtracted from the hydrostatic pressure. This can be carried out in two ways: either by using two independent pressure measuring instruments and then generating the pressure differential in the downstream control unit, or by using special differential pressure measuring instruments with two process connections designed for this application. Pressure measuring instruments for level measurement are characterised above all by their media resistance and their relatively small measuring ranges. A further requirement for submersible pressure sensors is that the medium must not enter neither the cable nor the sensor itself, even at submersion depths of several hundreds of metres. In hazardous applications, such as bore holes or refineries, the measuring instrument must feature the corresponding ignition protection type. For use in wells, shafts and bore holes, the design must be as slim as possible and there are high demands regarding the robustness of the (mostly very long) cable. With float-based measuring systems for level measurement, a distinction is made between float switches, level sensors and bypass level indicators. Float switches are used for the point-based limit level detection of one or several levels. The simple and proven operation principle of float switches is suitable for a very wide range of applications. It works independently of foaming, conductivity, dielectric, pressure, vacuum, temperature, vapours, condensation, bubble formation, boiling effects and vibrations. Depending on accuracy requirements, level sensors are available with reed chains or magnetostrictive measuring systems. Bypass level indicators are mounted on the side of the tank and are often combined with a magnetic roller display for a visual level indication. Optoelectronic switches are used in level measurement for point-based limit level detection. They contain an infrared LED and a light receiver within a glass prism. Optoelectronic switches are notable for their compact design and do not feature any moving components. With a measuring tip from borosilicate or quartz glass, and robust stainless steel cases, they offer a high media compatibility.